Best Rate Parking service near Orlando airport. Try this new parking experience, and you won't be disappointed. 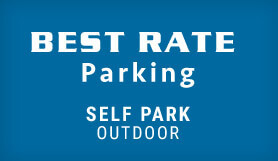 Best Rate offer Self-Park and Valet Parking options, with free shuttle transfers to and from Orlando Airport. Please call Best Rate once you have your luggage, and an agent will direct you to the pick up location, where you will be met and brought back to the car park to retrieve your car.